3D Pirate Ship Kite - Moar Stuff - You don't need it but you know you want it. 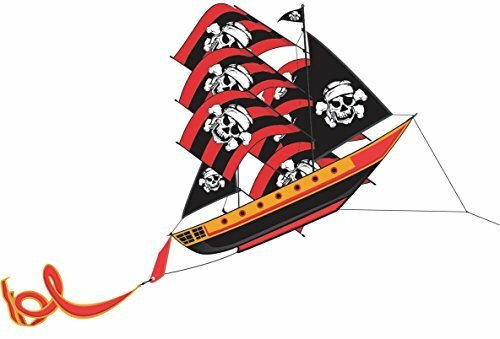 This 3D Pirate Ship Kite (via Amazon) is made of durable nylon and has a light fiberglass air-frame which allows you to loot and pillage other kites in the sky. Hey, It’s a pirate ship, what did you expect? It’s 72 inches long (including the tail) and is ready to fly with minimal assembly. The sails stick out to the side like three pairs of wings so this kite can really catch the wind. It’s single-string design is easy to fly and the boxy shape makes it pretty stable in the air. The only real downside is that it needs some fairly strong winds to fly well. It does best in breezes between 7 and 14 MPH. Any less than that and it will struggle to say airborne. Any more than that and it might break the string. It even comes with a package of string so you can start your looting and pillaging of the other kites right away. Dimensions: 72 x 33 x 28 inches assembled (including tail). Single-string design for easy flight. You’ll need, at least a 7 MPH breeze to fly it, though. Probably don’t want to fly it in over 14 MPH winds. Arrggghhh… It’s time to fly my kite, me matey.